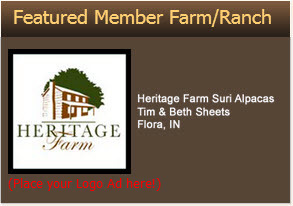 Add your logo Ad to the home page and/or other pages of the Suri Network website complete with a hyerlink to your farm page! We will create the ad from your logo or or other image of your choice. The ad will rotate with other ads at each refresh of the screen and will be active for one year. This is a great and affordable way to give your farm/ranch exposure on the #1 Suri alpaca website in the world! To begin, upload your square image by clicking the "Upload files" button in the box at the right. For best results, the image should by 160 x 160 pixels in size with a resolution of 72 or greater. We will add your contact information so that your ad appears as in the example above. For an additional $10 ($35 total) per year you can get addtional exposure by having your ad rotate on the Home Page of the Suri Network website in addtion to the other pages. Just select the checkbox under "Premium Home Page Ad". Then, click "Add to Bag" and complete your purchase. Your ad will be added to the website within 2 business days.